As much as Deathcore is an ugly word these days, Reading-based five-piece Viatrophy are doing more than most to bring the genre up out of the gutter. For one, their approach touches a variety of genres, preferring to take a more artsy approach that sees an experimental influence creep into the songwriting. This has resulted in a debut album that is far from the eye-rollingly average waste of space that it could have been – melodic intro Lux E Tenebris alone sounds like it came from a neofolk album, whilst the pounding first track proper Mistress Of Misery travels Deathcore territory with an intriguingly successful implementation of mosh riffing and even an ambient interlude that turns the song down a groove-ridden Meshuggah path that totally works and brings thing up to the Prog plateau instead of down into the moshpit. 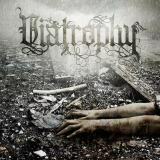 Viatrophy like to twist and turn in their songwriting, throwing a Deftonesy bit in amidst the stuttering riffs of Seas Of Storms without blinking an eyelid and having the instrumental chops to bring it off to a pleasingly epic conclusion. The likes of Eternal Darkness have more than enough ‘proper’ Death Metal in the mix to elevate them above the upturned noses of your typical elitist Death Metalheads, and interlude Aurora follows in the steps of the intro by being bloody brilliant – perfectly judged and providing a great foil to the next, Decapitated-esque track Scenes Of Extended Peril. Of course, there’s plenty of Deathcore chugging and gurning for the faithful to grimace through, but if, like me, you can enjoy the genre when it’s done well, there should be no problems with this, especially with the little atmospheric touches towards the end, a wonderful Tool-y bit sure to be enough to convince anyone of Viatrophy’s superiority over their peers. Fine, so it isn’t all top-notch – Sufferance is a bit crap, and the Cradle Of Filth-esque Futile Prayer doesn’t quite work as well as the band clearly wanted it to, but hey, they tried, and if you’re not brought to your knees in awe at the seven-minute The Final Light, channelling early Cult Of Luna in a wonderful example of a band aiming for the stars and making them their own, then your ears don’t work properly. Admittedly, ending the album there would have been perfect, leaving you wanting more and hungering for the next release, but the actual closing track – a four-minute slow-burner by the name of Treachery – works just as well, melancholic epicness coming to the fore as the meandering melodies work their magic on you. Highly recommended for those ‘core whores in search of something a little more leftfield in their moshpit music, Viatrophy are sure to go on to even better things.